The ePA State Navigator is a subscription-based consulting service that delivers state and federal electronic prior authorization regulatory intelligence. 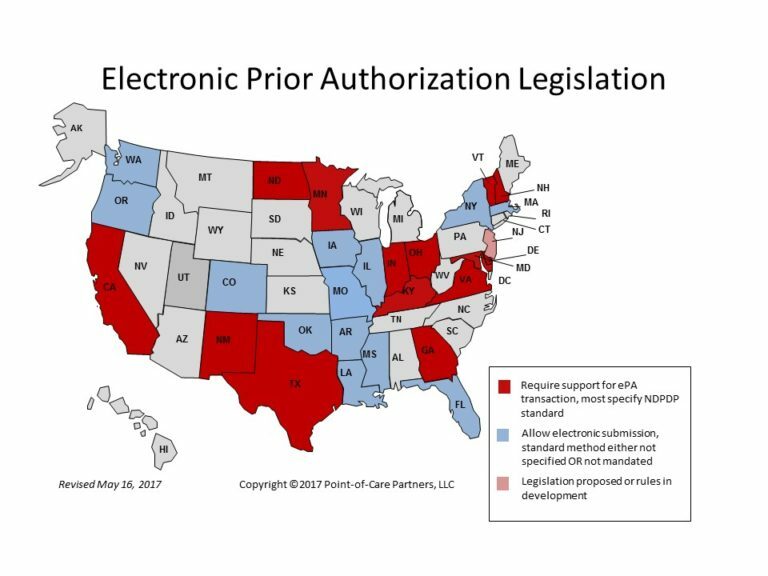 Point-of-Care Partners’ ePA State Navigator is a succinct yet comprehensive analysis of state and federal rules, statutes and standards governing the electronic prior authorization (ePA) of medications. It enables health care stakeholders to readily understand the varied approaches that states are taking to address the inefficiency of today’s paper/phone/fax prior authorization (PA) processes, which may include requiring timely responses to PA requests, standardizing PA forms and mandating electronic prior authorization (ePA). In many states, laws and rules are formed by an overlapping web of government entities including insurance commissions as well as pharmacy boards. The ePA State Navigator is a central source for stakeholders to understand the current environment of and future changes in the ePA ecosystem. We do the time-consuming research to deliver analysis in an easy-to-read, summarized set of business rules for busy software product managers. Which states require electronic submission of PAs or will require it (and when)? How can the PA information be transmitted? Which states have standardized their prior authorization forms? Do their rules require expert interpretation? Attain peace of mind with comprehensive research of state-by-state rules, regulations and laws, both adopted and proposed, on electronic prior authorization. What does the Navigator cover? Fully updated quarterly with intermittent alerts for urgent changes, the Navigator presents ePA regulations for the 50 states and Washington, D.C.
How do I access the Navigator? Contact us to receive more information about the ePriorAuth State Navigator. ePA automates the prior authorization process by electronically enabling a PA request for a medication and a real-time response. Now that there is an industry standard for ePA, many states are requiring ePA and running pilots. As ePA subject matter experts, Point-of-Care Partners can help PBMs, payers and EHR vendors implement the new standard and assist drug manufacturers in understanding the impact of ePA. Check the map below to see the latest developments in your state. Please do not reproduce without the expressed written consent of Point-of-Care Partners.